With the demise of the Go Go's & the Bangles (Yeah, so they did put out an album...but decided NOT to promote it) one is left to wonder: who is left to carry the flame of girl-driven power-pop? Never fear, because like some bizarre Star Wars saying, "there is a new hope"...Lisa Mychols! 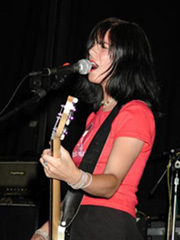 We've talked to Lisa a couple of times over the years, first about her time in the group the Masticators (in 2001) and then about her solo Christmas/Winter themed CD (in 2003). Well now Lisa has released her own solo album of pure, unadulterated power-pop. This interview we ask her about her fabulous new album and her upcoming plans to help spread the power-pop gospel of Lisa! E.C. : You've had some impressive releases in the past such as the Masticator's CD and your LOST WINTERS DREAM - do you consider SWEET SINSATIONS as the CD that most captures the "sounds in your head" when it comes to music? Lisa: I think each project I work on is a product of what I am going through during that time which is partly a reflection of the type of music I might be listening to. Projects like "soundtracks" for that time in life and the things that inspire me for those moments. Also, the fact I have other people working with me bring their own ideas in and in melts into an "our sound." But I do have to say when I write, I usually can hear the whole production in my head! Sweet Sinsations was going for a more "present" and "today" sound, as opposed to the others. E.C. : Compared to your other CD's, how smoothly did the songwriting and recording go? Lisa: The songwriting was fun! I was very inspired which, of course, made me want to record right away. But like with other musicians not signed with, lets say, a major label, you don't always get to record when you want. You need lotsa cash or a home studio with someone to work it that is willing to devote lots of time with the artist. That is not easy! Believe me! Like pulling teeth! That part doesn't always go smoothly. But it sure fired me up to invest learning to do it myself! That's right! Monkey Village Studios is coming soon and I'm going to work it! E.C. : "Take A Ride" almost sounds like classic Cheap Trick! Are you a big fan of that band? Lisa: Haha! Hey that is cool! I actually wrote that song from being inspired by soft rock from the late 70's! There is some good stuff out there. I don't understand why some older folk laugh at what they themselves used to listen to! Anyway, I think the song is called "You are the Woman". That song inspired "Take A Ride", actually. I don't know the name of the artist but the rest of the song goes, "I saw your face and that's the last I've seen of my heart." Great lyric! Makes me giggle and cry at the same time! I LOVE Cheap Trick. It seems a couple music scenes went through a huge Cheap Trick obsession at the same time and it got so big I think people started backing away because it turned out not being so cool anymore! hee hee. They were a great 70's band and I think they inspired that decade very much. They remind me of going to the beach too-their music has a lot of "vibe"! E.C. : You originally played bass before guitar - why did you only play bass on a few tracks of your new CD? I LOVED your bass playing on "Living Doll"! Lisa: I was good on that track! I was so proud of myself. I was totally inspired and HAD to play that part! But as far as really, really great amazing bass playing goes Steve Kobashigawa is so it! He is my idol! No, not just a friend I am saying nice things about...he really is a master! He played on some of Lost Winters Dream, too. He has a style that I like songs I write to have but I don't seem to fit that groove they way Steve can. I like using other musicians when I can. I admit I had to learn a few instruments out of necessity in case no one could play for me but I adore using other people besides myself, if I can. It feels more like your having a party in your song and you get to be a hostess! E.C. : "Times Two" (from your 3-song sampler CD) is such a cool tune. Why didn't it make it to SWEET SINSATIONS? Lisa: I felt is was too psychedelic for the song sequence. Just didn't feel like it fit anywhere. But it's one of my favorite, favorite, favorite tracks as well as on the top of favorite music styles! It is, however, one of the tracks off of the upcoming EP release of IN THIS CITY coming out on Wizzard In Vinyl in Japan next month...yet! E.C. : The Wondermints had Brian Wilson play on their last CD. Who would you have loved to have played on this album? Lisa: Darian Sahanaja! Sniffle...he is too busy for me now. Lisa: Oh yes! I am already on it. I am ordering a map of the United States with a box of thumbtacks. I am so on it! E.C. : Being a female artist, is the Bangles/Go Go's comparison inevitable? Lisa: Oh yes! Especially Susanna Hoffs. But you know, I really admire her so it's totally cool. I sort of brushed her off for a while because I wanted to be compared with guys! It's just everyone seems to except guys as musicians more than girls. Most of my favorite music are usually all guys too. I mean, there is not much girl action out there as far as the music me, The Bangles, or The Go Go's play. Why is that? Can you do an article on this one? E.C. : Speaking of musical tastes...what CD's (or vinyl) would we find on your player at home? Old stuff? New stuff? Or mix? Lisa: Well first, I am totally back into my Ben Folds Five stage! I think 3 of their discs are seriously present in my machine right now! I have been listening to them constantly! I want to learn piano! They were so great together! Also in my machine is Martin Denny and Arthur Lyman. I am into this reflection-observant-exotic stage right now. I hope it reflects in my writing! It usually takes a few months before it actually takes effect. I remember listening to a lot of KISS and Cheap Trick when putting The Masticators together. E.C. : If you could jam with any musician, dead or alive, who would be in your "dream band"? Lisa: Well, since you said dead or alive I choose Paul Weller when he was still on fire! He was on fire for a long time. He is someone I am sad I may never get a chance to meet in my lifetime. I've always appreciated his anger and passion! Plus he has always been a big supporter of females in music! E.C. : Half of the track for the Masticator's follow-up disc were recorded...any chance they will come out someday? Lisa: Naw. I don't even think they exist anymore, sad to say. I am going to re-demo them, actually. Probably when I go through my "I can't think of anything to write now!" stage. E.C. : What couldn't you find in a group setting that made you go "solo"? Lisa: I couldn't find anyone out there even close to what I do! I still can't believe it. Like everyone who does music like mine just threw in the towel or something and disappeared. I interviewed people, oh! and the stories I could tell you! You just can't go by shared influences anymore. I just wanted people in a band that GOT IT! It's frustrating because I am SO not a snobby musician or an obsessor about what a band HAS to be! I just want to play REAL music and represent it as cool and as great as it possibly can be! ...whew! I think I needed to get that off my chest for a long time! But also, I have been told for years to go solo and use my own name only. I just always assumed that would make people think you were a folk artist. A band just seems more appealing to go out to see-but I had no other choice and rather than "fight the fabric" I chose to "work with it"! E.C. : Any plans yet for a follow up to SWEET SINSATIONS? Lisa: Yes! I am actually working with a U.S. label presently. Once my work station in Monkey Village Studios is up and running I can demo out the songs I have been working on and start recording! This time around it won't take as long because I wont let it! But good sources tell me it was the tortoise that won the race!